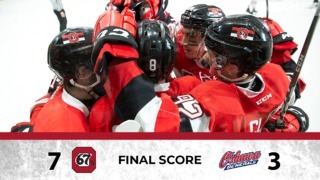 The Ottawa 67’s start their weekend off on Saturday with a crucial four point game against division rival Oshawa. 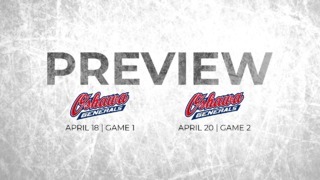 Sunday the team welcome’s Owen Sound and former goaltender Olivier Lafreniere in the Attack’s only visit to TD Place this year. The Ottawa 67’s rookie has proved to be a versatile asset for the Barber Poles this season. Mitch has cemented himself as the team’s second line centre and has taken roles with both the team’s penalty kill and powerplay units. Hoelscher runs point when the Barber Poles gain the man advantage and quarterbacks the powerplay. The 17 year old was recently named as a Top 100 North American Skater by NHL Central Scouting and is coming off a solid weekend that saw the 6’ product of Elora, Ontario net a goal and assist in each game and finish +2 for the weekend. Ottawa native Serron Noel returns home Saturday night as part of the opposition. The 6’5” winger has proven he’s a goal scorer, more than doubling his goal total from last year 45 games into the season. 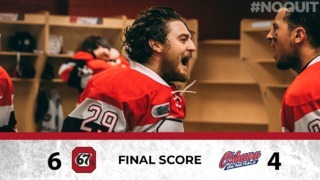 Noel was recently a teammate of 67’s defenceman Kevin Bahl during the 2018 Sherwin-Williams CHL/NHL Top Prospects game. Noel picked up a goal in the loss but was recently named a Top 10 North American Skater by NHL Central Scouting and is projected to be selected in the first round of the NHL Entry Draft this offseason. Suzuki, the 13th overall pick in last year’s NHL Entry Draft by Las Vegas has been following up his impressive sophomore campaign with similar numbers. Last season Nick finished the year with 96 points (45G, 51A) in 65 games, a points per game average of 1.48. So far this season Suzuki has 67 points (25G, 42A) in 45 games played for a points per game average of 1.49. Suzuki, a notable omission from Team Canada’s World Junior roster was a member of Team OHL during the CIBC Canada Russia Series and scored two goals and added an assist in two games played. The 5’11” centreman has been playing well as of late with 17 points (7G, 10A) in his last 10 games.